La Salette Journey: The inability to kneel is seen as the very essence of the diabolical.. I think the very physical act of kneeling before the Lord stirs reverence for the sacred, and elicits in the human soul deep faith. What has become of the liturgy in modern churches is truly tragic. Excellent article. 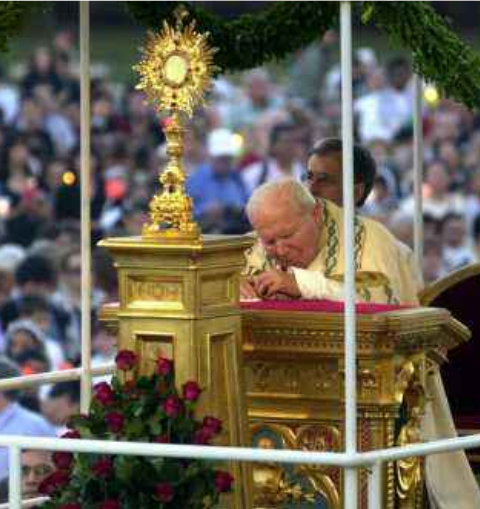 How revealing that the person alleged to be pope of the Roman Catholic Church, Francis 1st, refuses openly,and consistently to kneel either at the consecration of the mass he offers or in public before the exposed Blessed Sacrament. It clearly is not a physical problem because the aforesaid individual kneels before politicians and Moslems. I have arrived at a decision that Francis 1st is no longer , even if he ever was, a valid legitimate pope. That the safest option is to revert to the status quo ante, ie Benedict XVI is the sole legitimate pope his resignation being canonically defective. That you for this oh true post. God help our Church. During this Holy Week let us pray for Her with heartfelt humility and adoration of our Eucharistic King. Lord Jesus have mercy on us! Bring us to our knees! As I am writing this Notre Dame burns, the spire has fallen. These are indeed dire times. A pope who departs from the Gospel, who comes "preaching a different Gospel", leaves the sheep with no shepherd on earth, but One in heaven. He has not left us, will never leave us. Take heart, fellow pilgrims, Our Lady, and Our Lord, are with us and very close.